Cambodia, once a mighty kingdom, now a country triumphantly overcoming its bitter past. Cambodia or Kampuchea has seen both good times and bad throughout its lifetime, and now, as it rises from the ashes of its recent travails, it does so as a phoenix, ready to burst into a glorious and brilliant flame once again. Cambodia used to be a significant power in the region, though: far stronger than it certainly is now. This is the seat of Angkor Wat, the largest religious monument in the world (and certainly one of the most impressive preserved), as well as Angkor itself, the largest pre-industrial city in the world. At its zenith the kingdom was unrivalled in the area, although its nadir—arguably the dawn of the Khmer Rouge centuries later—would sink it into near-infamy. One, in fact, that has ironically aided its tourism by bringing in visitors to the war sites and memorials… to such tear-strewn places as the Killing Fields. But Cambodia deserves to be visited and known for so much more than the Khmer Rouge’s regime. This is a place where you can visit quaint villages like Kampong Cham right along the Mekong and sample the local flavor and relish for life, a place where ancient ruins like Preah Vihar and Koh Ker can be found cradled by untamed tropical lush. This is the country of such seaside getaways as Sihanoukville and Kep, with their sapphire-blue waters, where even the past horrors of the Khmer Rouge seem to wash away into the seas of serenity. Cambodia to today’s traveler is hardly the dangerous country it was before, yet it still manages to offer more than its share of excitement and adventure. Its checkered history has left it with a fascinatingly checkered topography as well, where aggressive modernization (as in Siam Reap) can coexist with pockets of wild mystery like the Cardamom and Elephant Mountains. This is a world with many worlds within it, which is guaranteed to make even the most jaded traveler salivate at the prospect of a visit. History not only remembers the glory days of a country, but also the ugly face of its wars. Cambodia has had its fair share of violence from the powerful dictatorship of one man, Pol Pot and his Khmer Rouge soldiers. He ravaged the country from 1975 to 1979 and in that short period of time was able to execute 17,000 people or more. Almost 10,000 bodies were dumped in an area in Choeung Ek, more popularly known as the Killing Fields of Choeung Ek. According to historians and analysts, Pol Pot’s reign may have killed a total of 1.7 to 2.5 million people in a country with a population of only 8 million. Located in the capital city of Phnom Penh, Cambodia’s Silver Pagoda is a beautiful symbol of the Khmer’s religiosity and artistry. Also known as the Temple of the Emerald Buddha, the Silver Pagoda is truly a stunning site that tourists should not miss. The structure is made of marble and concrete, its floors are laden with silver tiles, and it showcases an emerald Buddha and a 90-kg solid gold Buddha. Inside are precious artifacts and jewels. 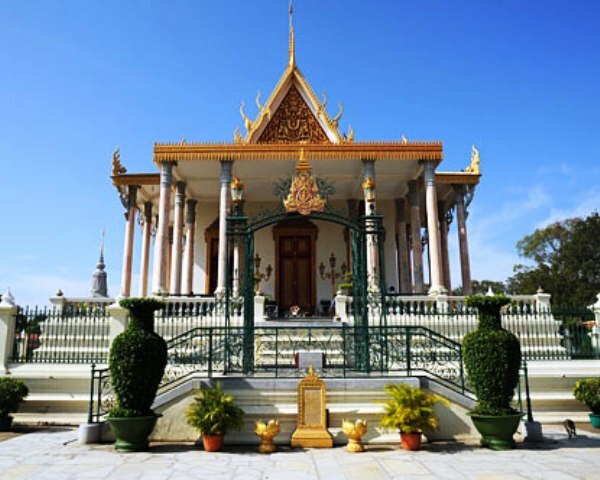 Clearly the most important and visited landmark in Phnom Penh is the Royal Palace near the Sisowath Quay. Within the compound of the Royal Palace is the equally important Temple of the Emerald Buddha that was opened in 1902 and renovated by King Sinahouk in 1962. During the renovation, Sinahouk laid on the main floor area a total of 5,329 pieces of silver tiles, which add up to more than 5 tons of pure silver. This is why the temple is more popularly referred to as the Silver Pagoda. The pagoda’s other name is “Temple of the Emerald Buddha” because of the emerald Buddha within the main worship area. 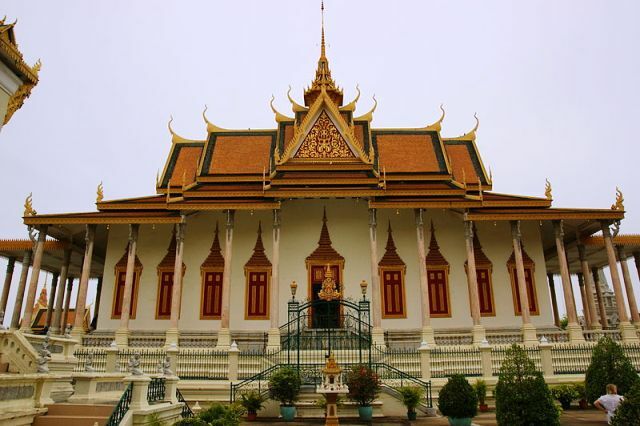 The National Museum of Cambodia in Phnom Penh is the country’s main and major repository of national treasures, relics and heritage. 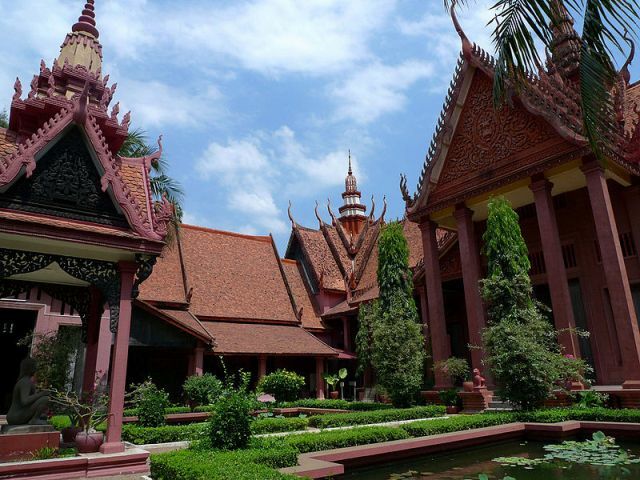 It is clearly Cambodia’s largest and most important museum of cultural history and historical and archaeological treasures. Believe it or not, the tiny city of Phnom Penh in developing Cambodia has its own Olympic Stadium, although the summer games were never held here. Also referred to as the National Sports Complex, Phnom Penh’s Olympic Stadium can seat 50,000 people, but may be expanded to accommodate up to 80,000. 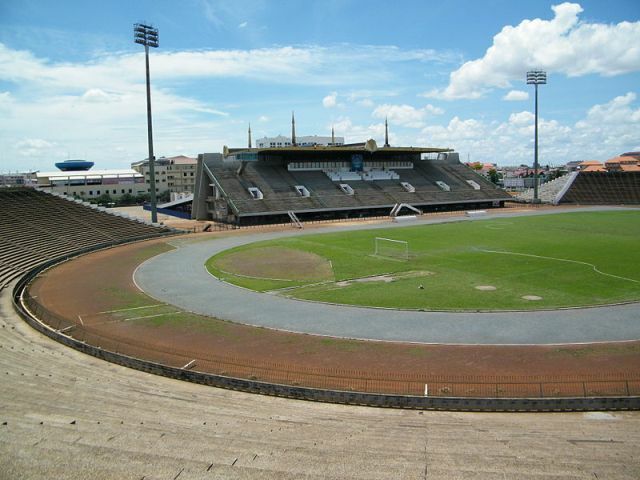 So, what is an Olympic Stadium doing in Phnom Penh? 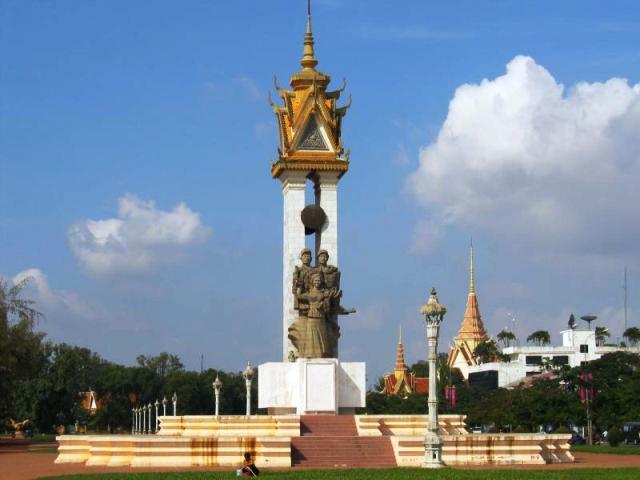 At the heart of Phnom Penh are two memorials celebrating Cambodia’s independence: the Independence Monument and Liberation Memorial. The former is a memorial commemorating the country’s independence from the 90-year rule of France in 1953. This very prominent structure of a Buddhist stupa resembling those in Angkor Wat was built in 1958 and inaugurated in 1962. 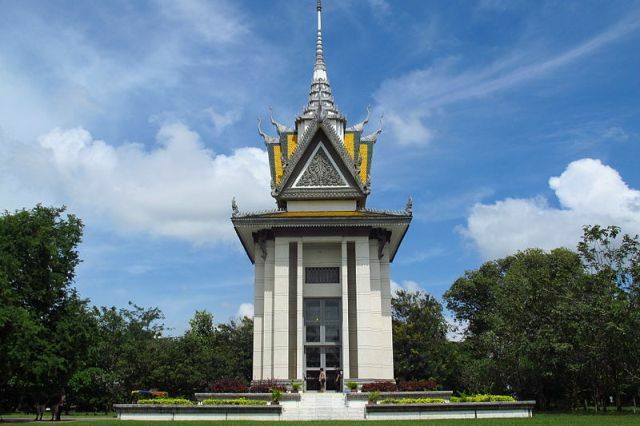 On the other hand, the Liberation Memorial is the younger landmark, having been built in 1979 to commemorate the Vietnamese capture of Phnom Penh and the end of the bloody reign of Pol Pot and the Khmer Rouge army.